Sasha Farina. Paper. Play. : Heading out to love. . . Heading out to love. . .
First up - the giveaway from my fabulous fellow DT at Studio Calico, Celine Navarro. Read on for what she has to say. . .
MAKE YOURSELF HAPPY AND TAKE MY ONLINE CLASS! Come join me for my first 4 week class : you will learn many techniques (my favorites! ), you'll be inspired by trendy color combos, you'll be in love with new sketches, and you'll participate in the most fun, colorful, technique workshop you've ever taken! · VIDEO tips and techniques! And you'll be able to order the kit if you want to. 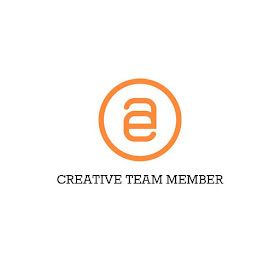 Click here for more info on payment and such. Next up, a layout. Some of you have seen this one on the Studio Calico's blog two weeks ago, I think. but I have never shared it here. 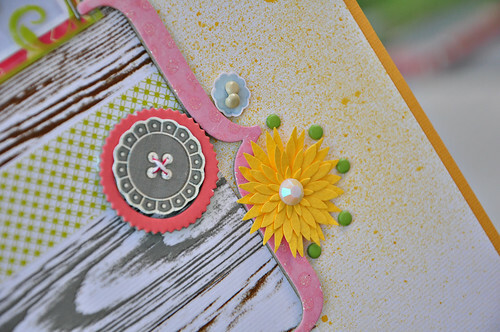 Some misting, Martha Stewart butterfly punch and yellow flowers from Baker's Dozen, Sassafrass buttons, and a whole lot of SC's Rub Ons. I dug through my bits and pieces from old kits and my own stash to complete this layout and had a blast. So I'm gonna run now. Nidhi and me are gonna fetch Neha and fly drive to my parents. It has been a while since we spent sometime together and I miss them so. Remember to leave me a comment if you want a chance to win Celine's online class! 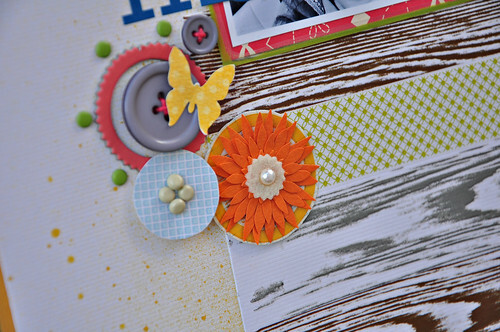 Love your layout, am loving those vibrant colors from Studio Calico. Oh, yes I would totally looove to win a spot in Célines class :o) It looks so fun!!! Wishing you a lovely day!!! This is so gorgeous Sasha. Love the mist, the buttons, the rubs - all of it!! And I'd love a chance to win a spot in Celine's class - sounds awesome!! Looks like a great way to spend the Summer break - what a great class! 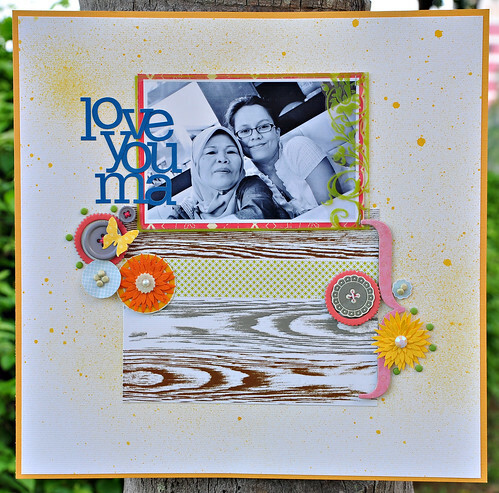 Stunning layout of you and your momma!! Always love those little details... seriously!! I'd love to do this class - to win it for free would be perfect! Love that layout girlie and that sure looks like a fun class! Oh, I'd love to win! Love the cuuute LO of you and your mama...y'all are adorable! girl, you blow me away with your talent! I love that layout! and please put my name in the hat for Celine's class giveaway! yow! that would be cool to participate! I love the title work on your page and those lovely buttons. And yes, I'd love a chance to win a spot in Celine's class :) - that's my dream! Thanks! I'm repeating myself, I know, but I just LOVE everything you do!! Gorgeous layout! what a pretty photo of the tow of you! gorgeous LO girl!! Love it all! Sounds like a great class! Love your LO! Oh would love to take her class. Thanks so much! I need this class soooo very badly...I really hope I win it!! Unfortunately, I'm at work and all Flikr items are blocked, so I can't see your layouts....but I know they are gorgeous as usual! 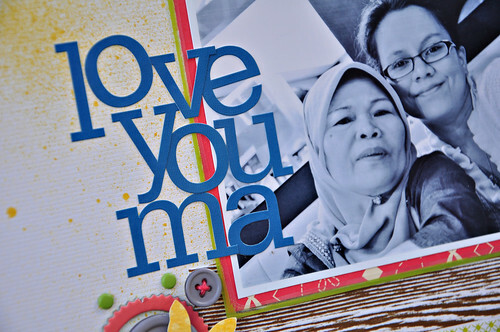 What a beautiful LO of you & your mom! Love the colors! I hate soccer and my menfolk will be glued to the TV.Celines class would be my own little respite. Me me me! ;) pick me!lol! Love that lo. You never fail to amaze me sayang;)tfs! I would love to take Celine's class. :) Thanks for chance to win! Have a great day! Love your layouts and would LOVE to win a spot in celine's class!! First I love your style girl! The layoust are great ! I would love to take this online class Celine's has the most awesome ideas ever! Beautiful layout! Celines class looks like a lot of fun too... I would love to take it! :) Hey ya! Just trying my luck here... Love your LO! don't count me in but i'm in LOVE with your art!! have a wonderful WE !! I would love to win the class..I have never really done a class like that before! Love your layout..it is beautiful! Hi Sasha, love the misting in your LO and thanks for this chance to win a spot in Celine's class!